Wat Panit Sitthikaram was founded in 1920 by a group of merchants, wealthy residence and local folks of Southern Pa Sang community who, before that, were devotees of Wat Pa Sang Ngam (located not far away from each other) but wished to separate and built a new temple that could accommodate the caravans for its halfway lodging. The majority of the caravan are Yong merchants of Chinese descendent and Burmese merchants of Thai Yai descendents (at the time called Ngiew) who travelled selling goods such as cotton from Lamphun in various regions. The temple is located at the halfway point for cattle merchants. 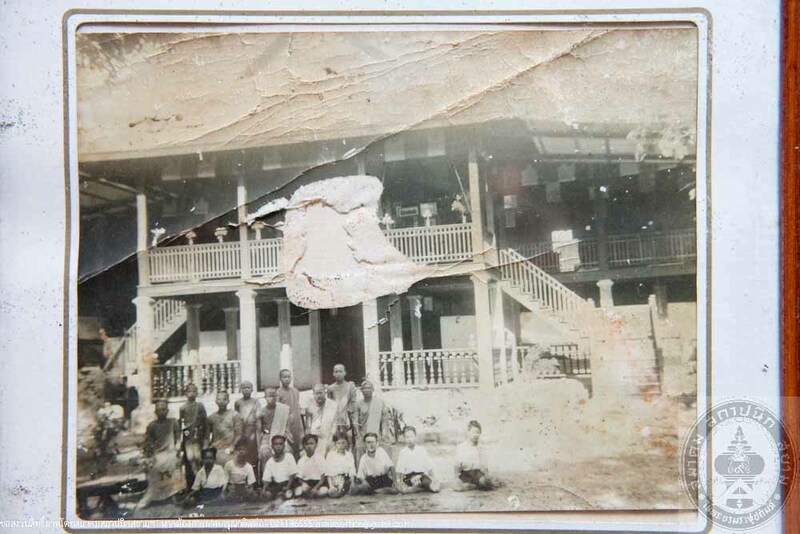 Shortly after, Kruba Nu Dhammavutti of Wat Ko Muang in Pak Bong District (currently known as Pa Sang) of Lamphun province to serve as the first abbot. Chief Superintendant of the Northwest Ecclesiastics named the temple “Wat Phanit Sitthikaram” which reflects the purpose of the co-founders who were mostly merchants. Kru Ba Pad Phromseno became the second abbot from 1933 to 1942 when the temple was at its most prosperous. Kru Ba Pad was a disciple who was especially close to the well-renowned Kru Ba Prommachak (Brahmachakko) of Wat Phrabat Tak Pa which benefited the temple under the management of Kru Ba Pad in the construction of the monk’s living quarters including Yanwitchayonuson Residence and the temple became widely-known. Wat Phanit Sitthikaram was granted consecrated boundaries on February 9, 1961 measuring 40 meter wide and 80 meter long. Yanwitchayonuson Residence had been accommodating the monks until the new residence was built in the years 1996-1998 to commemorate the 50th area accession to the thrones. The old residence was later used to store properties of previous Abbotts, monks and novices. 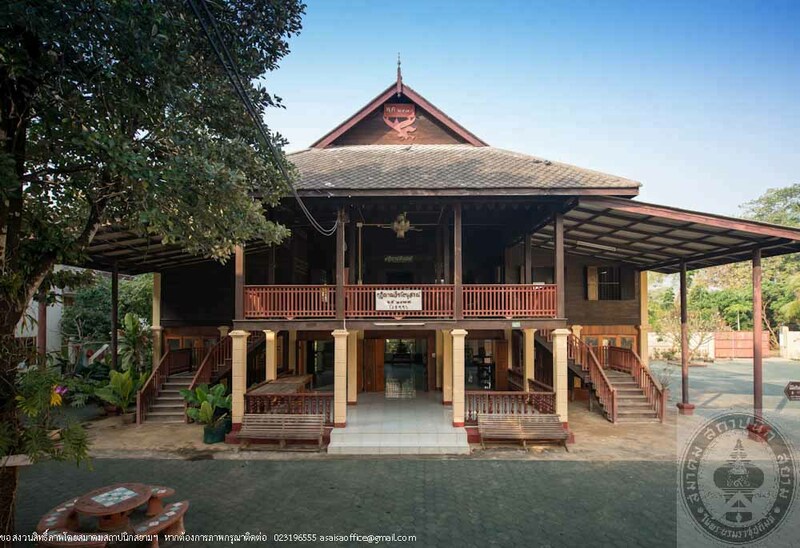 In 2010, Pa Sang Municipal District initiated a project called “Restore and Inherit the Beautiful Pa Sang.” The project was later funded by Chiangmai Provincial Public Health Office in the renovation of the old residence into “Wat Phanit Sitthikaram Community Museum” in 2012. Yanwitchayonuson Residence is a two storey building half brick half wood. The rectangular shape is of 8 meter wide and 18 meter long. The center part is an open front porch, 5 meter wide and 8 meter long that connects to the twin L-shaped staircases from both side of the building. The front porch structure was supported by concrete pillars with small lotus-shaped capital on the top section called “Med Bua” (Lotus Seed) which indicate the social status of the architecture. 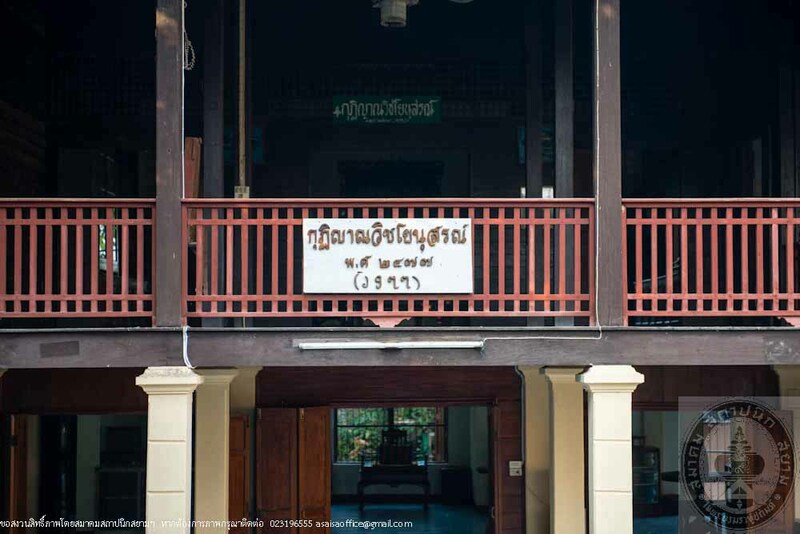 According to Lanna’s belief, “Med Bua” is only reserved for residences of the royalties or monks and Ho Tham. This Med Bua capital is not common in ordinary homes. Manila style gable roof covered with gray kite-shaped tiles. Front porch gable end features wood carving of Garuda carrying a sign engraved with the number B.E. 2477, the year the building was built. Mounted on top of the apex on the roof are “Soranai,” or wood finials of about 2 feet tall. A very popular piece of architectural ornament all over Lamphun and Lanna from Rama V period until 1967. 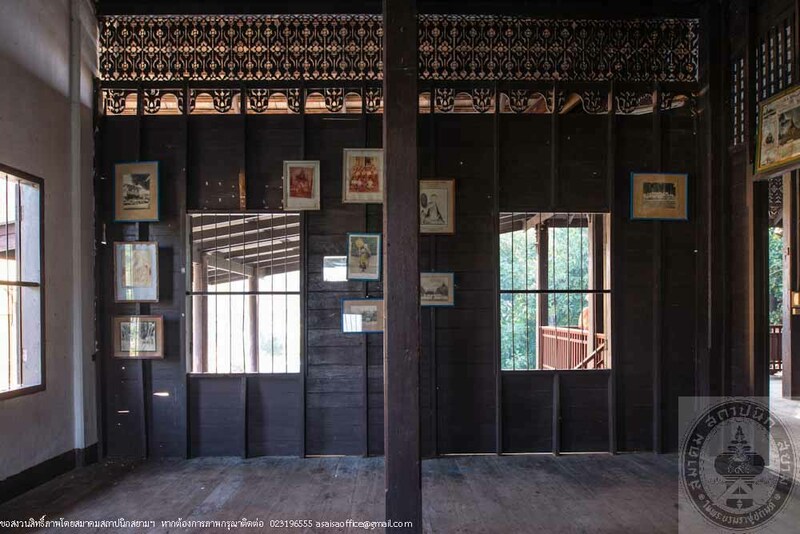 Area under the ceiling between the upper floor pillars is decorated with carved wood panel eaves (Pan Nam Yoi,) floral patterns, a work of wood carving by skilled craftman of Yong tribe. 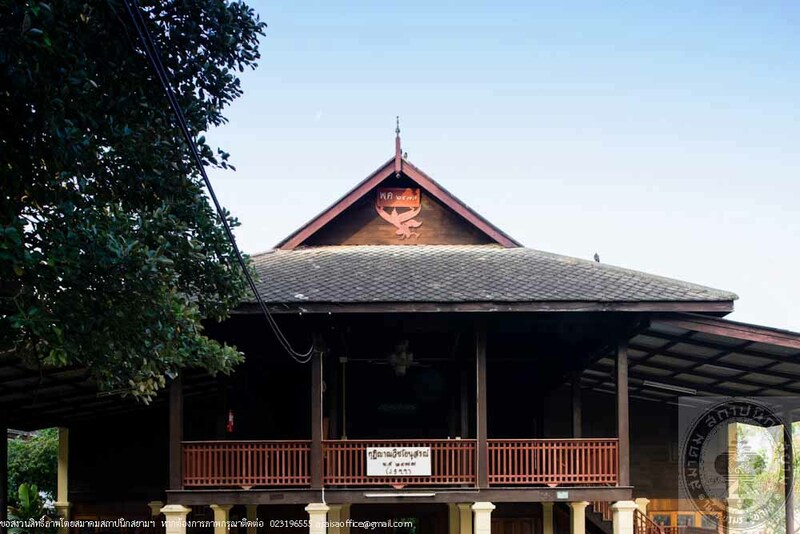 First floor usable area consist of a large open hall and an exhibition room that showcase a concrete mold used during the temple construction, wood carvings used to decorate the old ordination hall as well as other multi-purpose cabinets. 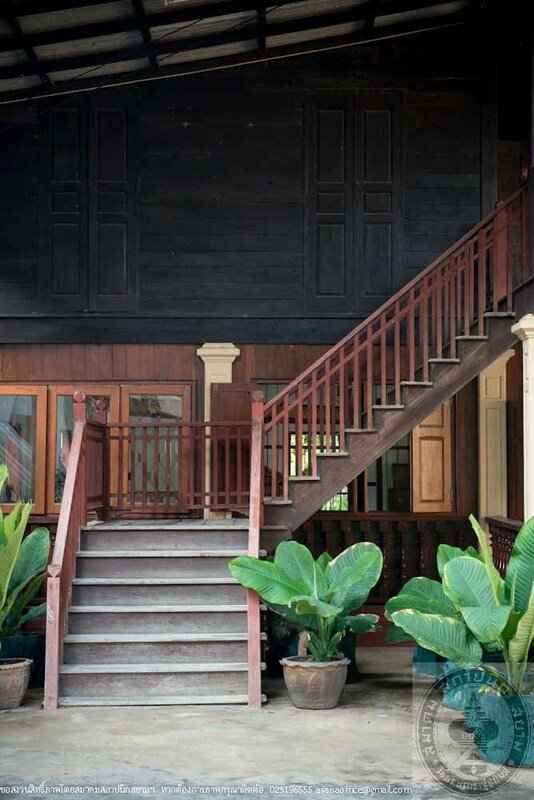 Upstairs’ functional area consists of a balcony in the front, a hall in the center and three exhibition rooms. 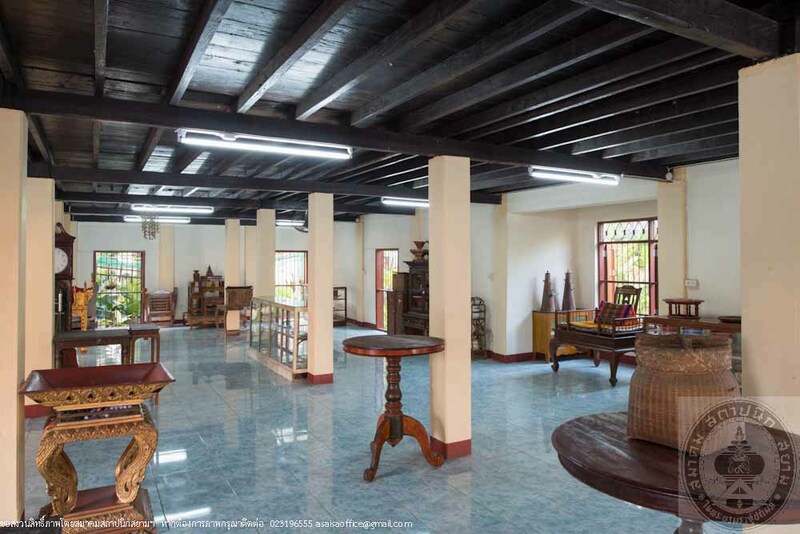 The front left room houses Lanna traditional musical instruments owned by the temple and donated by local folks. The back left room stores kitchen wares, china, tea set and betel box. 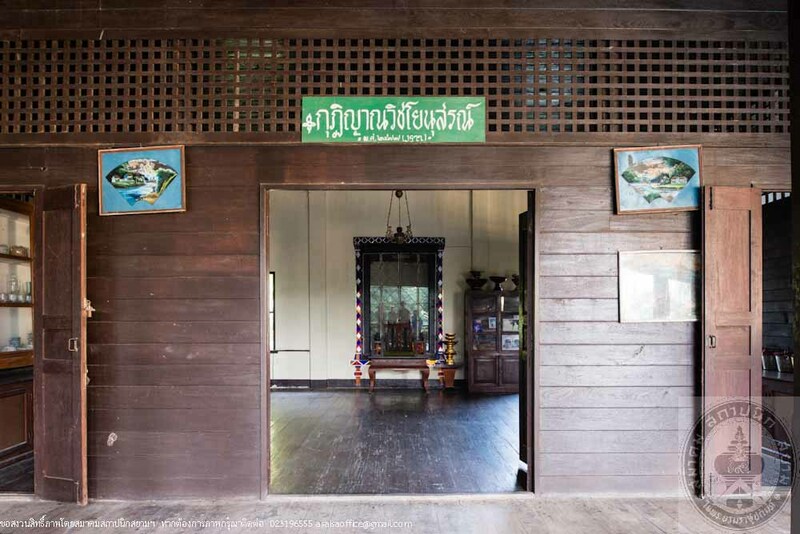 The room to the right tells a history of Wat Phanit Sitthikaram though photographs. Wide plank flooring in all of the second floor rooms. Ceiling board with wood frames. Two panels hinged doors and windows with patterns. 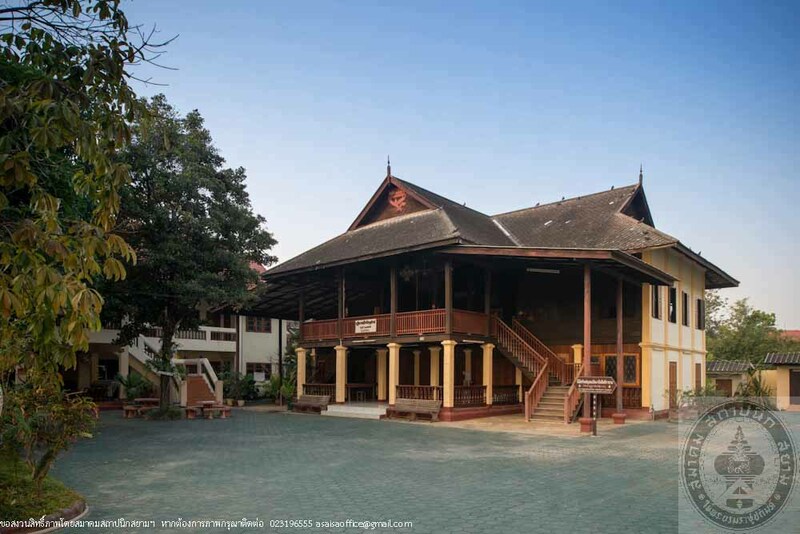 “Wat Phanit Sitthikaram Community Museum” was established in order to renovate the old and abandoned Yanwitchayonuson Residence into a museum or a center of learning on history, architecture, culture and tradition of the Yong community. Supports of skilled personnel in designing and planning poured in from various sectors such as Hariphunchai National Museum; Fine Arts Faculty, Chiang Mai University; and in form of an advisory committees that consisted of local scholars. All the party involved are currently in the process of updating and adding new contents and exhibited objects in order for the museum to be more complete.